First row (L to R): Nancy O'Boril Lorchak, Patricia Davies Jordan, Margaret Ann Havron Julo, Mary Horoschak Billig, Peggy Klimek Gazo, JoAnn Philipovic Barnisky, Andrea Perbetsky Holubek. 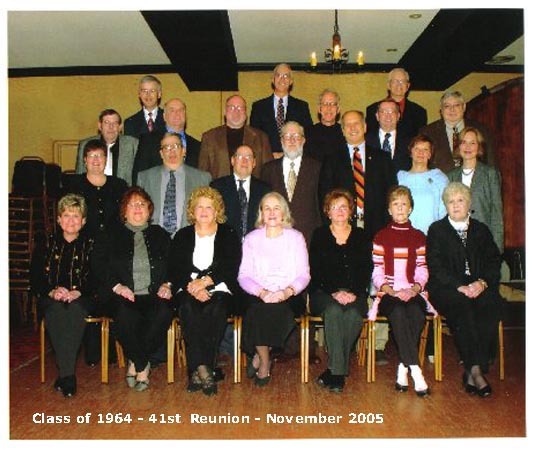 Second row (L to R): Beth Hollywood McDowell, William U. Jones, Richard Kellner, Richard Ashmore, Thom Terry, Shirley Gerger O'Brien, Elizabeth Stanalis Panchura. Third row (L to R): Norman Richards, Russell Futchko, Joe Pisanick, Robert Winsko, Sammy Watkins, Joe Petrash. Top row (L to R): Joe Sicenavage, Jay Hoffman, Frank Miller.